Malaria prevalence differs between the two islands that comprise the archipelago of São Tomé and Príncipe. This may be due to differences in the biology of local Anopheles gambiae, the only vector on the islands. Survival rate and feeding frequency are two factors influencing vectorial capacity. Anophelines generally feed just once per gonotrophic (oviposition) cycle. Newly emerged insects, however, may feed two or more times during their first oviposition cycle thus increasing the likelihood of becoming infected. The reasons for multiple feeding are not clearly understood and it is still uncertain whether the behaviour is facultative or obligatory. We, therefore, determined survival and sporozoite rates, and examined the behaviour of An. gambiae from the two islands during their first gonotrophic cycle. The wing size of 1,410, abdominal condition of 687, gonotrophic age and mated status of 7,264 female M form An. gambiae collected by light-trap, landing catch, resting outdoors or in copula, was determined from four sites in the archipelago. Sporozoite rates assessed by ELISA in 15,533 females from São Tomé and 2,111 from Príncipe were determined. Estimated survival rates ranged between 0.834–0.849 per day in São Tomé and 0.801–0.818 per day in Príncipe. Sporozoite rates of 0.63% in São Tomé were significantly higher than the 0.24% from Príncipe. Overall 49% of females mated on the second night after emergence before feeding, and 51% on the third night and thus fed before mating. The likelihood of mating before feeding increased with wing size. None of the 3,776 parous insects collected showed evidence of recent mating. All but two of the 198 females collected in copula had undeveloped ovaries. 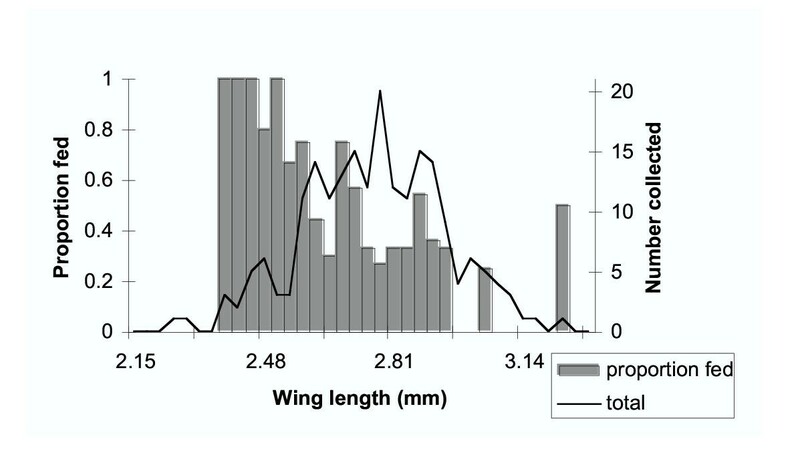 Mean wing sizes and the number of insects collected in a sentinel light-trap varied but the proportion of newly emerged insects in the collection did not. The estimated survival rate of the smallest insects was lower than other size groups, but the overall size distribution of each age group was normal. Parous insects were gonotrophically concordant. Differences in mosquito survival contributed to the lower sporozoite rates and endemicity of malaria on Príncipe compared to São Tomé. On both islands all newly emerged insects blood fed on the second night following emergence but only became gonotrophically active on the third night after emergence. Smaller insects had a higher 'mortality/emigration' rate than larger ones. We suggest that insufficiency of Juvenile Hormone until the third day of adult life is responsible for gonotrophic inactivity and that by partitioning mating between the second or third day after emergence females maximise their chances of out-crossing. Survival rate and feeding frequency are two of the most important factors influencing the vectorial capacity of haematophagous insects. Anophelines generally feed just once per gonotrophic (oviposition) cycle. Under some circumstances, however, they may feed more than once, and so go through a pre-gravid phase. The reasons for this are not clearly understood. Whilst pre-gravid feeding in parous insects may be a side effect of host defence , newly emerged insects may need to compensate for nutritional deficits during the larval stage. Nutritionally deprived adults are smaller than their siblings. Being small has a number of associated costs: the smallest insects are less likely to mate [2–4] and they may die earlier than larger ones [2, 5]. Insects that manage to take a preliminary feed may, however, compensate for their nutritional deficiency and the probability of their subsequent survival may then be the same as that of larger insects . Factors other than size may also influence feeding behaviour in young insects. Although not a prerequisite for host seeking and feeding, mated state influences egg development after feeding  and a number of authors considered that non-insemination is the reason females take two blood meals during their first oviposition cycle [8–11]. Indeed, in Burkina Faso only 7% and in coastal Tanzania only 25% of pre-gravid Anopheles gambiae had mated [12, 13]. More recently, however, the effect that mating has on the behaviour of anophelines has been called into question , and in their extensive study Lyimo & Takken  found that 66% of pre-gravid An. gambiae s.l. were fertilised. Gillies , who first described pre-gravid behaviour, came to the conclusion that, in coastal Tanzania, such a phase was obligatory for newly emerged An. gambiae s.l.. This would mean either, that every insect that emerged was nutritionally deprived, or that nutritional state, by itself, might not be responsible for the behaviour. Indeed Hogg et al. found that engorged pre-gravid An. gambiae from The Gambia were not smaller than females that became gravid. Thus it is still uncertain whether pre-gravid behaviour is facultative, i.e. the result of larval competition, or obligatory, and hence a characteristic of the species. If small insects have a higher mortality rate than their larger siblings, it is of interest to know when the excess mortality occurs, since this may be a period when all insects are vulnerable to potential control mechanisms. On the archipelago of São Tomé and Príncipe, it is possible to collect the rDNA M molecular form  of An. gambiae at all phases of the gonotrophic cycle. Malaria prevalence is lower on Príncipe than on São Tomé . We determined survival and sporozoite rates of An. gambiae from the two islands and examined pre-gravid behaviour among them. We suggest how the observed behaviour may help maximise out-crossing in this species. Females from all stages of the adult life cycle were sampled between March 1997 and December 1998. Most collections were performed in Riboque, a peri-urban area of the main town on the island of São Tomé [17–19]. Newly emerged and post-prandial females were collected from outdoor resting sites, particularly the underside of houses built on stilts . Females in copula were captured by sweep net as they fell out of swarms. Host-seeking insects were collected indoors, all night, by a sentinel CDC light-trap hung close to the bed of sleepers protected by a mosquito net. A damp sock suspended in the collection bag resulted in high survival rates among the collected mosquitoes. Light trap collection was performed on an almost daily basis between the 2nd of April and the 30th of June 1998. The location of the light-trap house and sampled swarms are given in Charlwood et al. . The majority of resting collections were also undertaken close to these houses. Host seeking females were also collected outdoors by landing catch between 21.00 and 23.00, the hours of peak biting activity (Charlwood et al., unpublished). In Riboque, collections were undertaken twice a month. Altogether, 51 sites were surveyed. In addition, landing collections were performed, but less regularly, at a second locality from São Tomé and at two from Príncipe. In Almoxarife, a coastal village located 9 km to the south of Riboque. Collections took place outside 11 of the 18 occupied houses. In Rua dos Trabalhadores, a peri-urban area of the only town of Príncipe, collections were performed close to 7 of its 71 houses. In Praia das Burras, an isolated fishing village located on the northern coast of Príncipe, insects were collected close to 22 of the 45 houses in the village. Tree diagram representing the criteria used to classify female An. gambiae on dissection, according to the appearance of their reproductive tract. 'Virgin' – with an empty spermatheca. Such insects invariably had follicles at Stage N-IIe. 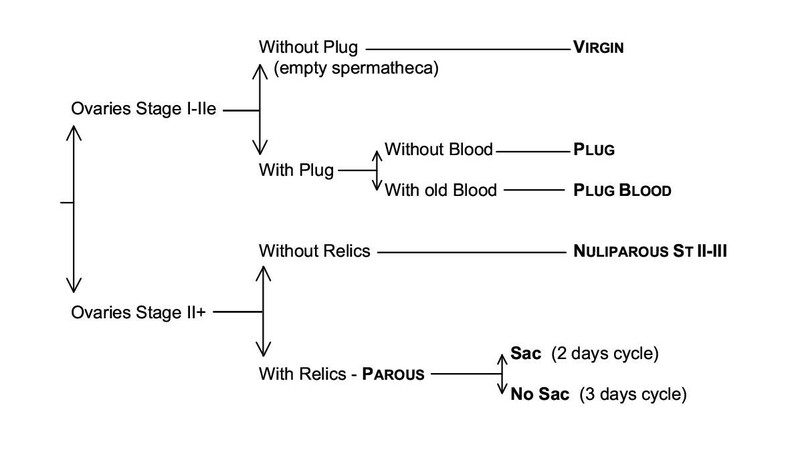 'Plug-unfed' – with sperm in the spermatheca and a mating plug in the common oviduct (indicative of mating shortly before collection, ), with no trace of blood in the stomach and with ovaries at Stage N-IIe. We assume that these females when caught host-seeking were coming for their first feed. 'Plug-blood' – as above but with the remnants of a previous blood meal, distinguished by its dark colour, in the stomach. These insects had previously fed as virgins. This category could only be determined from insects collected in the light-trap. 'Nulliparous II-III' – without follicular relics, with a clear ampulla and coiled tracheoles, with sperm in the spermatheca, (with or without a mating plug). Follicles at stage II or stage III. 'Parous with sacs' – insects in which the follicular stalk was distended (this being evidence of recent oviposition, ). Host seeking insects with sacs were considered to have a two-day oviposition cycle. 'Parous without sacs' – parous insects in which the sac following oviposition had contracted. These were considered to have experienced a 24-hour delay between oviposition and re-feeding and hence an oviposition cycle lasting one day longer than the gonotrophic cycle. For some collections the sac stage of parous females were not classified. A two-site ELISA with monoclonal antibodies was used for the detection of circumsporozoite protein in individual mosquito heads and thoraces from light trap or landing collections [23, 24]. Wing length has recently shown to be correlated with mosquito mass [2, 6, 25], which itself is an indicator of nutritional state at emergence. Wing length was therefore used as a proxy for mass. The distance between the alula notch and the wing tip, excluding scales, was measured to the nearest 0.03 mm, using an ocular micrometer on a stereo-microscope in samples collected from Riboque. In order to determine if mating is necessary for egg maturation recently emerged virgin insects, collected as pupae from Riboque, were given the opportunity to blood feed up to three times. Egg development was determined by dissection. Meteorological data was obtained from the National Meteorological Office of São Tomé. Daily survival was estimated using the formulae provided by Vercruysse  in which the sample is divided into three categories: i) first feeding nulliparous insects (comprising 'virgin' and 'plug-unfed' females), ii) second feeding nulliparous insects (comprising 'plug-blood' and 'nulliparous Stage II-III' females) and, iii) parous insects. As with simple parous rate determination the method assumes that all age groups are equally likely to be sampled, that the population is in equilibrium and that survival is independent of age. The ratio of the number of virgin insects collected on day t to the number of plug-blood insects collected on day t + 1 was used to estimate the survival rate of insects that fed as virgins and returned to feed immediately after mating. Estimates of mean oviposition cycle duration were determined using the formulae of Charlwood et al. . In order to determine whether survival rates differed significantly between islands, we used an indirect approach based on a chi-square test to assess differences in age composition distribution. One-way Analysis of Variance (ANOVA) was used to assess significance of differences in mean wing sizes among age groups. A total of 5697 and 1567 host seeking An. gambiae were dissected from São Tomé and Príncipe respectively (Table 1). 1649 (29%) of the insects dissected from São Tomé and 605 (39%) from Príncipe were taking their first blood meal. Overall approximately half of these insects were virgin (802, 49% from São Tomé: 294 and 49% from Príncipe) (Table 1). The proportion feeding as virgins in landing collections remained relatively constant throughout the year. Only one of the 1158 recently mated insects examined had two mating plugs. All nulliparous insects with ovaries at Stage II and all parous host seeking insects dissected had mated but none had a mating plug. The proportion of virgin insects among Anopheles gambiae taking their first blood meal relative to the mean number of insects caught at that location, location of possible breeding sites and collection method from the islands of São Tomé and Príncipe. Estimated survival rates from São Tomé were approximately 84% per day but rates from both sites in Príncipe, at 80–82%, were significantly lower (χ2 = 55.2, d.f. = 2, P < 0.001), resulting in the expected infective life of mosquitoes from São Tomé being approximately twice that recorded from Príncipe (Table 2). On the other hand, the estimated oviposition cycle length at both sites in Príncipe was longer than that obtained from São Tomé (Table 2). Age structure, estimated oviposition cycle duration and estimated daily survival rates of host seeking An. gambiae females according to collection location. The overall wing size of females collected in the sentinel light-trap in Riboque according to their gonotrophic age is shown in Table 3. The mean wing length of virgin females was significantly smaller than all other age groups combined (ANOVA, F = 5.43, P < 0.001). Mean wing lengths of all other age groups were similar. In all cases the distribution was approximately normal (Figure 2). Mean wing length of virgin and all other age groups collected from the sentinel light-trap in Riboque, São Tomé. (n = 262 for virgin and 1091 for other age groups). Wing length of female Anopheles gambiae collected in the sentinel light-trap and outdoor resting, Riboque, São Tomé, by physiological age. During the time that the light-trap was run on a daily basis in Riboque mean daily temperatures declined, from 28.5°C in February to 26.1°C in July. The number of An. gambiae collected over this period declined from an average of 165 per night in the first week of collection to 13 in the last week (Figure 3). Culex quinquefasciatus also comprised a significant proportion of the catch. While the number of An. gambiae decreased, the number of Cx. quinquefasciatus increased (Figure 3). Recently emerged first-feeding insects comprised a substantial proportion of the An. gambiae catch at all times. The proportion of these that fed as virgins also showed little variation (43 of the 78 first feeding insects dissected in the first week and 28 of 44 dissected in the last week were virgins, χ2 = 0.84, d.f. = 1, P= 0.360). As temperatures declined the mean wing lengths of the An. gambiae increased (Figure 4). 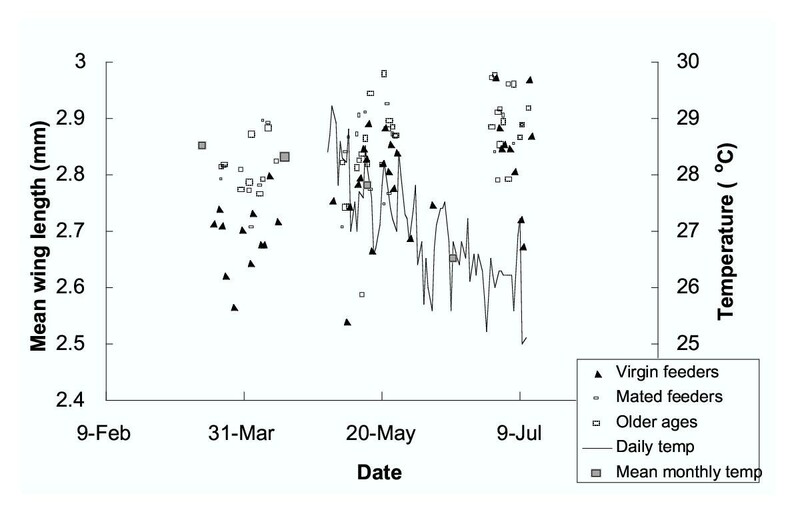 The mean wing size of insects that fed as virgins in July was similar to the mean wing size of other categories in March. Number of Anopheles gambiae and Culex quinquefasciatus females collected in a sentinel light-trap in Riboque, São Tomé, from the 8th of May to the 16th July 1998 and mean daily temperature recorded at the airport, 7 km from the collection site. Mean wing lengths of virgin feeding, recently mated and older female Anopheles gambiae collected in a sentinel light trap, Riboque, São Tomé and daily and mean monthly temperatures. Only one third of the expected number of plug-blood insects were identified from the light-trap collections giving an estimated survival rate of 0.31 among insects that fed as virgins. The only significant correlation obtained between any of the different age categories, with delays up to four days, was that between 'virgin' and 'plug-unfed' insects collected on the same day (r2= 0.69). Survival rates and oviposition cycle length in insects collected in the light-trap were similar to those obtained from landing collections (Table 2). Eighty-six (43%) of the 198 females collected in copula had blood-fed as virgins. With the exception of two females, one engorged and one semi-gravid, which were collected on a single evening, all previously fed females had only a small amount of blood in their stomachs. The two exceptions were collected after a night of inclement weather when swarming and mating activity were curtailed. The wing length of females in copula that fed before mating was significantly smaller than those that mated before feeding (ANOVA, F = 22.6; P < 0.001). 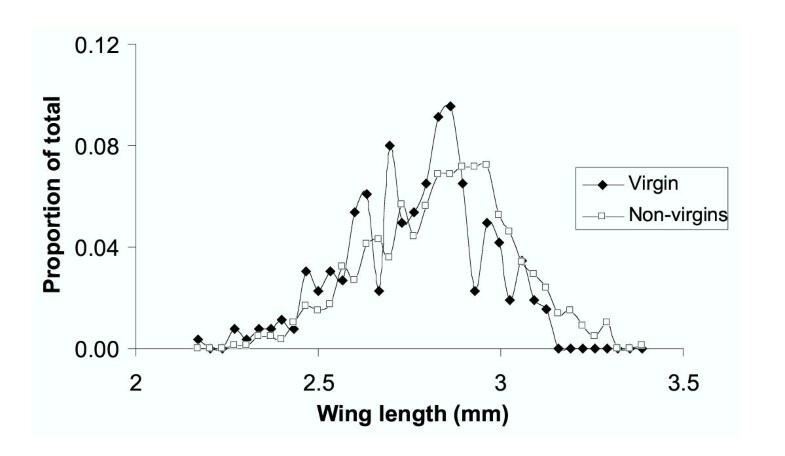 The proportion that fed before mating decreased steadily with wing length (Figure 5). Abdominal condition and physiological age of female Anopheles gambiae caught resting out of doors, Riboque, São Tomé. In the laboratory the great majority of insects collected as pupae emerged shortly after sunset. Gonotrophic development failed to occur in these females following a single blood meal taken 24 hrs later, despite the fact that many appeared to feed to repletion. Gonotrophic activity occurred in a proportion of females after two feeds and this increased with a third feed (Table 5). Ovarian development in virgin female Anopheles gambiae, collected from the field as pupae, dissected 24 to 48 hrs after feeding, according to the number of blood feeds taken. Our estimates of daily survival of An. gambiae from São Tomé were comparable to those obtained elsewhere in continental Africa [26, 28–30]. Estimates from resting, landing and light trap collection from São Tomé were similar. However, the estimated 4% difference in daily survival between São Tomé and Príncipe resulted in a halving of the expected infective life. This is likely to contribute to the significant differences in sporozoite rates observed between the islands, which in turn are likely to contribute to the lower endemicity on Príncipe. Despite similar biting rates (Table 1), an overall parasite prevalence of 53% in people from São Tomé has been recorded, whilst in Príncipe a prevalence of 35% was recorded . Lower survival of mosquitoes on Príncipe may be due to the numerous very heavy rainstorms that can occur at times when mosquitoes might be in flight. The number of mosquitoes dissected for oviposition cycle estimation was relatively small and considerable error may be attached to the estimates obtained. Oviposition cycle length is likely to depend on the availability of suitable oviposition sites. In Riboque numerous puddles, archetypal habitats for the An. gambiae complex, existed close to the houses used, whereas in Príncipe they were only found at some distance from collection sites. Location of sample site rather than sampling method may also affect the proportion of virgin to mated first feeding insects in collections from Riboque. 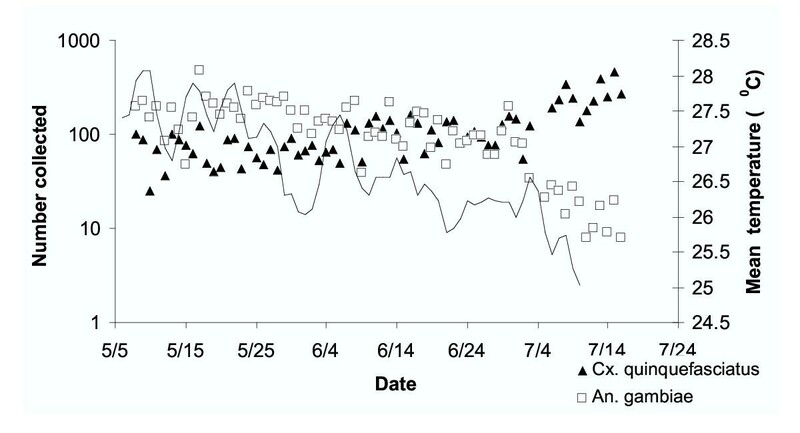 As appears to be the case for endophilic, anthropophagic vectors in Tanzania , blood feeding per se does not appear to pose a problem for the mosquitoes since the great majority of unfed insects from resting collections were newly emerged. In contrast to other studies  the decline in number of An. gambiae collected in the light-trap was not associated with a relative drop in the proportion of newly emerged insects in the collection. As a result of the El Niño Southern Oscillation (ENSO) the start of 1998 was the driest and hottest of the previous 44 years http://www.supramics.com/climate/chapter2.html. Lower temperatures could have extended the duration of the larval stage .This may have reduced recruitment and, hence, resulted in a decline in population density. The conditions that were detrimental to An. gambiae favoured Cx. quinquefasciatus. In Riboque the latter species breeds largely in underground septic tanks. Water temperature would be less affected by cool nights and at the same time the absence of rain would render the water levels more stable. Overall, wing size distribution of both females and males  was close to normal, an indication that competition was not important in larval populations . However, the overall mean size (2.82 mm) of female An. gambiae from São Tomé was considerably smaller than the 2.97 mm described from The Gambia . There was a considerable overlap in wing sizes between insects that mated before feeding and those that fed before mating. During the cool season mean wing size of insects that fed as virgins was similar to that of females that at other times mated before feeding. This indicates that, although important, size by itself was not responsible for insects feeding as virgins. Although the majority of smaller females survived to mate, they did not appear to survive beyond that stage as evidenced by a relative absence of small females among older age classes. As observed with An. funestus , but in contrast to the results of Okanda et al. , males in copula did not appear to discriminate between larger and smaller females. Takken et al. reported that once newly emerged small insects feed, their chance of later survival is the same as their larger siblings. Emigrants are included as deaths in survival rate estimates. If active dispersal (the oogenisis-or-flight syndrome, ) away from breeding sites occurs in An. gambiae, it would do so during the first gonotrophic cycle. Given that many of our samples came from areas close to relatively well-defined breeding sites, dispersal of smaller insects rather than death remains a possibility. Unfortunately, landing collections are not suitable for determining previously fed status (because insects can feed during collection) and light-trap data was only available from a site close to a potential population centre. All females feeding as virgins and all recently mated insects collected in landing catches and light-trap had relatively undeveloped ovaries. Mated state would seem to have little influence on the likelihood of a first feeding insect taking a full or a partial blood-meal. Engorged insects with mating plugs collected resting had ovaries at only stage I-II and it is not certain that they would have become gravid. Given that all virgin feeding insects and all recently mated insects that took partial blood meal would also become pre-gravid, it seems reasonable to conclude that in São Tomé and Príncipe all female An. gambiae go through a pre-gravid phase during the first oviposition cycle. Similar conclusions were reached in studies of An. gambiae and An. arabiensis populations in continental Africa [13, 26]. Our observations enable us to tentatively reconstruct the early life history of adult An. gambiae in São Tomé and Príncipe. After emergence, female An. gambiae of all sizes rest until the next evening. Half of the insects, including most of the larger ones, then mate at sunset, prior to host seeking. The smaller insects mate on the following evening, after having blood fed the previous night. By the third night after emergence all insects have mated and all have taken one, pre-gravid, blood meal. Females that have survived thus far take a full blood meal on their third night post emergence and are subsequently gonotrophically concordant, most having a two-day oviposition cycle. Indirect estimates of multiple mating derived from DNA analyses of sperm in mated females indicate that 2.5% of female An. gambiae mate more than once . The absence of parous insects with mating plugs from light-trap or landing collection implies that if parous females do re-mate they will do so after feeding and before oviposition. Unfortunately, we were unable to ascertain whether the two females collected in copula with developing ovaries had previously mated or if their advanced egg stage was due to their being unable to mate on the evening prior to being collected. Nevertheless, even if they had previously mated, the proportion of females in São Tomé that mate more than once would only be in the order of 1%, half that estimated from genetic studies elsewhere. The almost constant proportion of newly emerged females mating a day after their siblings begs the question as to whether there is an evolutionary benefit obtained from this separation. The insects that emerge from the small, relatively isolated bodies of water used by An. gambiae may largely be siblings. They face the problem of how to reduce inbreeding. Males emerge a day or more before females, which presumably allows for maturation and some degree of dispersal and mixing of males before the emergence of the females. By mating on the second or third night after emergence females increase the likelihood of out-crossing, especially among those that feed as virgins and hence disperse to some extent prior to mating. Given that males can mate up to four times and on more than one night, by mating in equal proportion two and three days after emergence all males available for females on day 2 are also likely to be available on day 3. For mating to occur activity patterns of both males and females need to be synchronised . In An. gambiae it takes place in swarms mainly at dusk but with a limited amount of mating at dawn . Juvenile hormone (JH) has perhaps the greatest influence on female physiology. Titres do not reach a peak until 3 days after emergence . It is an important factor mediating gonotrophic activity. Slight differences in the titre of JH may affect the timing of female activity and thus the likelihood of a female on her second evening as an imago seeking a mate or a meal. We would like to thank the inhabitants of our study villages for their co-operation during this work. Our thanks to the entomological staff of the CNE who assisted with the landing collections and to Keim, Beke and Gil for their help in the collection of swarming insects. Thanks to Catarina Alves for her assistance in measuring the wings of the collected females. This work was funded by INCO-DC/EU (IC18CT960030) project "Studies on mosquito vectors in West Africa, aimed at malaria epidemiology and control". JP and JDC were supported by Praxis XXI/FCT, Portugal(BD/15754/98; BCC/7328/96) during part of this study.